Buddy Cox has little time to rest. Fresh off the first of two major projects he attacks each year, he knows he needs to start on the second. The first project is the Pumpkin Festival. As one of the festival's organizers, Cox works to make sure everything goes smoothly for the one-day event that brings thousands from across the Southeast to the Pumpkintown community each year. This year's plans were complicated by the fact that due to rain, the festival had to be postponed for a week. "In a way, we had to plan it twice this year," Cox said. Cox's second major project is Country Santa, a program that provides toys for hundreds of underprivileged children in the area. Over the years, Country Santa has been featured in countless newspapers and magazines, including People Magazine and Reader's Digest. Cox will be featured in the November issue of American Profile magazine. Before long it will be time to gather, sort and bag the toys for their Christmas Eve delivery. But that's OK. Buddy and his many volunteers are ready to work. What else is there to do? Worry. It's an emotion Cox tries to avoid as much as possible, but the situation this year certainly has Country Santa concerned. Because of the many layoffs and plant closings in the area, Cox knows the demand for toys could be the greatest in his 20-plus years of Country Santa. And the slow economy could mean there are less people willing to make contributions. Plus, since many in the area have already made large contributions to funds to help the victims of the Sept. 11 tragedies in New York and Washington, Cox wonders if people will have much left to contribute to Country Santa. "We're on the wrong side of a curve," Cox said. "The need is up, but the supply may be down." Already Cox's secretary is fielding 10 to 15 calls each day from people wanting to receive help from Country Santa. Because of the constant fluctuation of the economy, Cox is hesitant to start gathering names for Country Santa's list at this point. Families in need now may not need help by Christmas. Unfortunately, many families who are not currently in a financial bind may have their situation change by Christmas also. "Right now we're telling people that we won't start making our list until late November," Cox said. "We're relying heavily on different agencies to supply us with the names of people in need." So the process of gathering donations will consume the greater part of Cox's attention at this point. That task is monumental. Numbers fluctuate from year to year, but Country Santa usually provides presents for around 2,000 children every year. A conservative estimate of the value of each child's bag of Christmas presents is $50. That means that in less than eight weeks, Country Santa needs to gather more than $100,000 in toys in order to meet its needs. While Cox is concerned about the economic situation, he relies on his faith that everything will work out in the end. It was faith that led Cox to begin Country Santa more than two decades ago. Seeing the needs of others in his immediate community, Cox reflected on his impoverished youth, and how kindhearted people had helped his mother make ends meet. Cox, by then a successful engineer, decided to purchase Christmas gifts for children of these few families. The next year, the number of families grew, and some likeminded people contributed to Country Santa's efforts. Eventually, the effort grew to one that covers several Upstate counties, and has inspired similar efforts in other areas. Each year scores of volunteers visit Country Santa's shop to help clean, sort, pack and deliver thousands of bags of gifts across the area. "It's magic how it all falls together every year," Cox said. "This program doesn't receive a dollar from the government or any agency. It depends entirely on the kindness and love of people for their neighbors. It's as pure an example of the true Christmas spirit as I've ever seen." Donations of new or nearly new toys can be left at one of several drop-off points in the area, including the offices of The Easley Progress at 205 Russell Street in Easley. 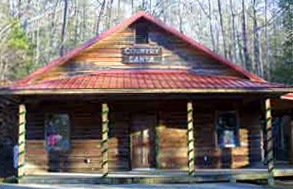 The second annual "Country Santa Run" will be held Nov. 10, 2001. In the event, motorcycle enthusiasts will begin at the Kmart/BiLo parking lot on U.S. Highway 123 in Easley, ride into Pickens, then into Liberty, before finishing the route at Redneck Engineering near Easley.